Earlier this week, I had an unfortunate reaction to a new face mist I was testing – the entire area under my mouth broke out in hives. I took some Claritin to mitigate the effects and laid off products for a few days so as not to enrage the beast, and it seems to have worked. The red splotches have disappeared, leaving in its wake scaly, itchy dry skin. This lizard-y feeling is similar to my month-long sunburn from September (not a good year for skin, eh? ), so as soon as my skin acted up again, I wasted no time in going the decadent route to speed up healing. 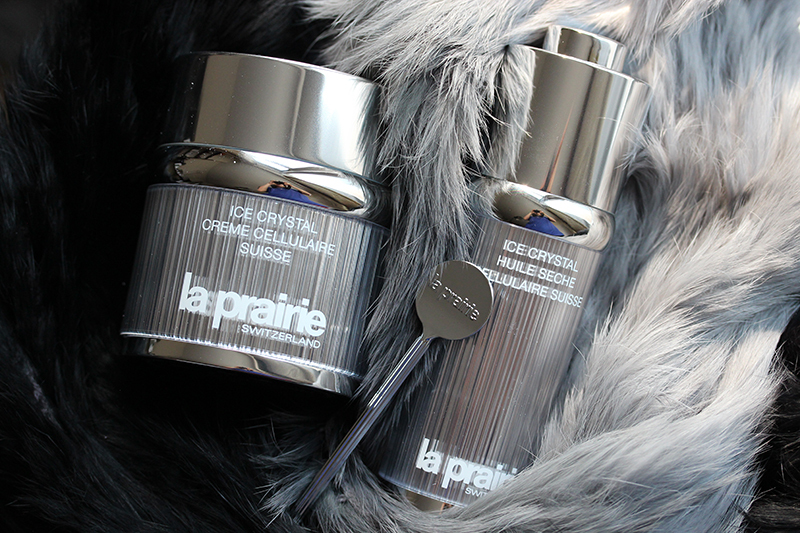 The most intense moisturizers I have on my vanity are the La Prairie Cellular Swiss Ice Crystal Dry Oil and Cream. In fact, I take it one step further by combining the two: a dollop of cream with a couple of drops of dry oil adds up to a formidable hydrating duo. When I apply the concoction to my face, I literally sigh with relief. I actually prefer the cream to the dry oil. The latter feels overly heavy to me, like it's sitting on instead of absorbing into skin. The cream, on the other hand, feels lighter than expected for such an intensive treatment. Both the dry oil and cream have a strong scent – I think of Enchanteur powders when I apply them to my face – which is not ideal, but I continue to use them since they obviously work. At $300 each, I hesitate to exhort anyone to purchase these, even if they do work wonders for my dry skin. I will say, if your skin always had trouble with winter, maybe venture out to a counter for a sample. La Prairie Cellular Swiss Ice Crystal Dry Oil and Cream are available at Nordstrom, Bergdorf Goodman, and laprairie.com. Full disclosure: This entry contains a gift from the brand. This entry also contains affiliate links.